Willow and Grace being puppies, Halia feeding Ripley. The Girls got WAY up in Halia's and Ripley's space, yet she just looks on... kids, amirite? Halia would turn occasionally to protect the week-old Ripley, but otherwise was happy to let the girls romp. Only once was a short, low growl heard, and the pups immediately backed off and resumed antics. They are even starting to fetch! Willow (the cuddler in the purple collar) is more likely to actually return the toy. Grace (red collar) is more likely to play keep away, or steal it from Willow. 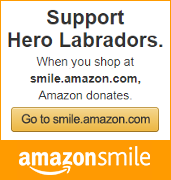 Be sure to follow Hero Labradors on Youtube and share our videos, and watch as many times as you like!